Select Paper Size (5). We tested with 30252, 30334 and 30336. We recommend 30334, as it can be printed out very quickly. 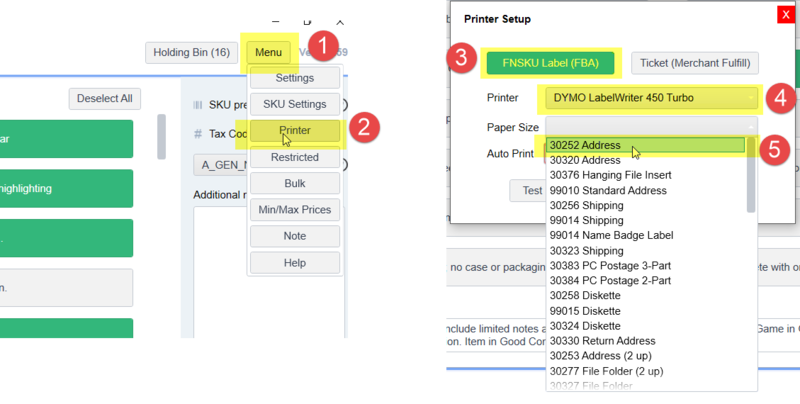 Change Dymo printer Orientation based on your selected label. Please see below. Click Test Print to verify the FNSKU label can be printed. 30252 1 1/8 × 3 1/2, set Orientation to Landscape. Order here. 30336 1 x 2 1/8, set Orientation to Landscape. Order here. Dymo LabelWriter 450 Printer window will display. Select Landscape or Portrait in Orientation based on your label type. Click Apply, then OK.